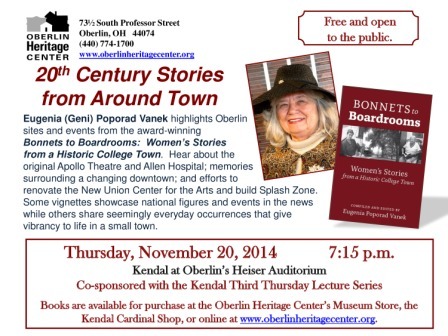 November 20 (Thursday, 7:15 p.m.) 20th Century Stories from Around Town Author Eugenia (Geni) Poporad Vanek highlights Oberlin sites and events from the recently published OHC book Bonnets to Boardrooms: Women's Stories from a Historic College Town, which includes recollections from fifty-two Oberlin women whose lives span the 20th century. Hear about the original Apollo Theater, Allen Hospital, and First Church; memories of a changing downtown; and efforts to renovate the New Union Center for the Arts and build Splash Zone. Some vignettes showcase national figures and events in the news while others share seemingly everyday occurrences that give vibrancy to life in a small town. Co-sponsored by the Heritage Center and Kendal's Third Thursday Lecture Series. Location: Kendal at Oberlin's Heiser Auditorium.